I shudder when I read an adder bites man story. The Daily Mail couldn’t resist the temptation to sensationalise this extraordinary tale, although to be fair it did point out the last death from an adder bite in the UK was in 1975. It’s an extremely rare event – rare enough that it gets plastered all over the National Press when it does happen. Adders aren’t easily provoked and they’re not “common throughout mainland Britain”. Far from it. Finding one in London is extraordinary. They’re pretty much restricted to some areas of southern England, Scotland and West Wales. Why? Loss of habitat but also persecution. I shudder about stories like this because they provoke hysterical reactions in people. We have a lovely big grass snake in the garden. They’re clearly not adders, but people cheerfully chop grass snakes’ heads off because they’re scared of them. I’ve even seen people take spades to slow-worms because they thought they were adders. Yuk. For the record, it’s illegal to kill slow-worms, grass snakes and adders. And people should think better of them. Slow-worms are fantastically helpful around the garden (and not snakes anyway). Adders kill small rodents, and with grass snakes are indicators of healthy ecosystems. I’m not thrilled by the idea of our grass snake eating our frogs and newts, but I am delighted we have so many it can. We used a butyl liner for our new pond, partly to see the difficulties it might cause. In the past we’ve used a really good product called Bentomat or just sealed ponds naturally, which – of course – have been easy to plant. Planting into plastic is more of a problem! This is something people often phone about – how do you get a natural look with a plastic liner? They look really unattractive, particularly when new. The edges are hard to hide and they crease and bubble. I hate using pots in ponds, particularly those terrible plastic ones you can buy in garden centres, but until recently it was impossible to avoid if you wanted a more instant result than natural colonization. Then some clever folk came up with a rather brilliant idea. Supposing you gave your pond plants a growing medium which could also provide them with structure under water? Grow them in coir, which would hold together until gradually naturally rotting down into the water, by which time he plants would be well established. We sell these coir mats or rolls, preplanted with a mix of commonly found aquatic plants, and I was dying to try them out myself. The new plastic pond was an ideal opportunity. Our coir mats arrived on a pallet, but couldn’t have been easier to put into position. They smelt lovely too – of water mint! 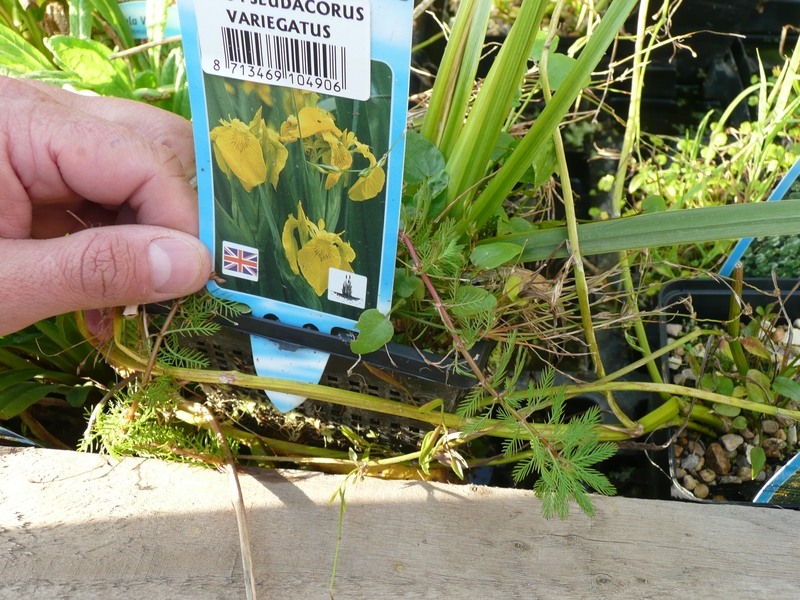 We pegged them down around the pond edge or weighted them down with stones, covering unsightly plastic.The idea is that the range of plants will migrate to the drier or wetter sections of the mats, depending on what they prefer. As our pond is firmly focused on wildlife it has gently sloping sides and a shallow floor, which is ideal for the mats. As an unexpected bonus we imported lots of water snails and some dragonfly nymphs – and even a newt! The pond is already looking a lot better, and I can’t wait to see it in three months’ time. I hope the new vegetation won’t just look good, but it should also bring other benefits – more fauna and an improvement in water quality. Our first generation of frogs, wriggling out of their spawn, should love it. As we approach 21st December and the end of the world, a quick reflection on Armageddon as forecast by the Mayans (for whom the end of the world arrived a good deal soooner, of course). Armageddon is a concept more familiar to my generation than to our children; when we were their age there WAS in fact a real chance that we would all be eviscerated, in a nuclear holocaust. We lived in Zurich for a while in the 90s and our house, like all the Swiss houses built then, had to have a nuclear shelter. Ours – a tiny concrete cocooned room with chemical loo and bunks – was filled with the detritus of family life and used as a wine store, for which civil disobedience we were fined. Even armed with several cases of claret we decided we really weren’t interested in surviving in a world inhabited by woodlice and Swiss people. Of course, humans have a primitive urge to want to survive, which mixes badly with a predisposition to believe the worst of everyone and everything. I guess this is what drives the uber-rich to live in gated ghettos in London suburbs and the deranged to live half way up mountains in the middle of nowhere. What is the point? Life without society is just surviving in an unconnected vacuum. For many of these folk the end of the world has effectively already arrived. People are free to do what they like, of course, and freer if they have the money to do it, but when you come to think about it, it’s pretty offensive. Folk who are “just surviving” seem to ascribe no value to our society or to our environment. As for me, I’m looking forward to 2013, or the Year of the Frog Ascendant as it’s known in this corner of Somerset. I hope frogs will be on the up next year – but that’s another story. People can’t recognize the plants around them any more, which seems a bit odd. You’d think they’d be a bit inquisitive about the flowers and trees they see everyday, but most people wouldn’t be able to identify an ash (let alone one that’s diseased). Many of our reptiles and amphibia are a complete unknown for most of us, particularly as they get rarer; I’m not sure I would have guessed that this splendid chap was in fact a native Briton – would you? * That lack of curiosity about what’s happening in our back gardens is problemmatic for the scientists. I went to a talk given by Pond Conservation’s Jeremy Biggs a couple of weeks ago, in which it became obvious that lack of funding and hence reliable data has been a real problem. As a result of PC’s work we’re only now getting sense of how polluted our ponds are, and how important garden ponds are in preserving our aquatic wildlife as a consequence. Fill in a Record Pool Sighting Card!Amphibian and Reptile Conservation and ARG UK, whose 100% fund we support, are asking folk to record their sitings of amphibia and reptiles. You can click on the button on the left to take part, and their website carries links to helpful identification resources. This sort of citizen survey might seem a bit gimmicky, but it’s not; we’re desperately short of this kind of information. Our reptiles and amphibians seem to be in sharp decline, but the experts aren’t sure how how bad things really are, let alone the reasons why. It’s also a good way of getting people to have a more careful and informed look at what they are seeing, which is a particular issue with anything looking remotely like an adder. Ignorance definitely isn’t bliss for the thousands of slow worms chopped up every year by gardeners who find them in their compost heaps. The arrival of this terrible disease is an opportunity to ram home this message to government, consumers and the retail sector, and we’re actively involved in doing that. We’ll have plenty more news on that front. *As you’d expect, all the fruit trees and native plants, bulbs and seeds we sell are sourced and grown in the UK from British seed or cuttings. Ponds are particularly dear to my heart, so it’s a special pleasure to announce that we’ve become a corporate associate of Pond Conservation, another of those Cinderella charities which does great work on tiny resources. We already give money to the Amphibian and Reptile Groups’ 100% Fund, so this further strengthens our ties in this area. We have also joined the Tree Council, and will be donating money to them too, from online sales of our native trees. We’ve posted the first recipe () on our blog, in which Caroline explains how to make a lovely present from pears. Or, of course, you could buy a pear tree as well, which we could get to you the week before Christmas. There are plenty more ideas on the website, including gift vouchers. 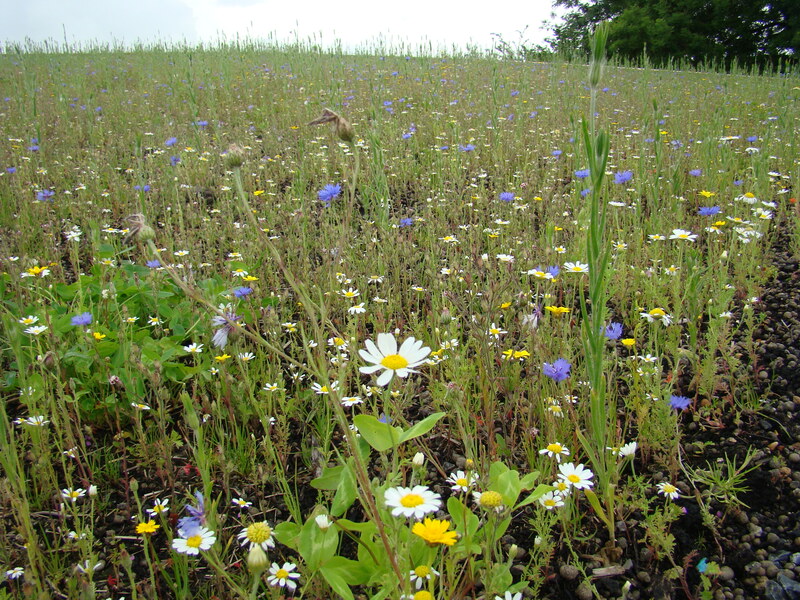 Habitat Aid is involved in some great school meadow and pond projects in the South West, but we’d love to do more outside our region. Any ideas? Thank you everyone for all your help and support this year. The progress we’ve made has been fantastic, and we couldn’t have done it without you. Do remember you can follow us on Twitter or Facebook to keep up with our conservation and gardening news. If I’d got the answer wrong my recent trip to the Herpetofauna workers’ conference in Telford would have given me plenty of shopping time. I had some early reassurance on the way to the Conference Centre when I walked past Telford’s bubbling blowing frog clock, but I was a bit nervous even if I’d got the gist of the weekend right. It turns out I shouldn’t have worried. The herpy crowd are an enthusiastic and entertaining lot, even though they wear trousers with too many zips and feel compelled to pun terribly, usually about newts. Many of them were from the various Amphibian and Reptile Groups (“ARG”s) of the UK, to whom Habitat Aid bungs a tiny amount of money to via the ARG 100% fund, which is a very good institution. I was pleasantly surprised by how accessible and engaging the presentations were; I enjoy listening to bright young academics, and I didn’t feel patronized. There was some inevitable mystification – I was puzzled by the problems with GCNs and gully pots*, for example – but I came away enlightened and enthused, even though I had to leave early and hung over on Sunday morning. I won a rather smart newt mug in Saturday night’s raffle, presented by Nick “Bugboy” Baker, which made up for the disappointment of our team coming last in a bizarre post dinner quiz (so far as I remember won by a team called “Slow Worms and Lesbians”). Other Herpy celebs there included Mr Biggs of Ponds, who is planning another major pond exercise with Pond Conservation. What take-aways can I bring you from the world of UK herpetology? First, the bad news. As I’ve blogged before, herps sit at the unloved end of the conservation spectrum. Snakes are scary and newts are expensive. Because people don’t like them we don’t spend enough money on them, which means we don’t know enough about what they do. This means there is a lack of hard information available to lobby the government to put more money into funding research and protection. It’s a vicious circle. Negative public perception and lack of reliable data were common themes running through most of the presentations and discussion groups. Unsurprisingly,the poor old adder featured regularly. In terms of specific issues there’s the chytrid fungus to worry about, which was the subject of a nationwide survey last year, and continuing extinctions; I would have liked to have met a Glutinous Snail before it disappeared from England in 2010. There was also the odd elephant galumphing about the conference room, like the lack of clean ponds in the UK. There are some good things happening, however. Ironically, the fact that herps are so far down the pecking order means that current cutbacks aren’t affecting government spending on them – even possibly the opposite. Perceptions are changing, partly down to the work ARG groups are doing, and folk are beginning to understand the advantages of having reptiles in their gardens (slow worms, for example, are great slug killers). The more widespread use of SUDS^ is creating new habitat for herps, and everyone seems to be agreed about the basic strategy of linking existing habitats. Our new garden here will be herp heaven, bursting with fantastic habitat, but I was reminded to get the compost heap built ASAP to get some slow worms in. Job now done. Now all I have to do is figure out how to make more money for the ARG Fund. I say catch (them) and stick them in a zoo. I for one would like to see them become extinct. Normally I manage to kill about 3 each year* but would be quite happy to try & catch them so long as I could relocate them into the conservationists (sic) garden. There is a definite INCREASE in Northumberland, so who in the hell claims they are declining lives in cloud cuckoo land. Are these people mad? Why exactly do we need vemonous (sic) snakes in large quantity or any quantity for that matter in an over populated island? More work for the NHS perhaps? This story is all BS I can take you to to adder sites all round my house; there is a 4 foot long one living on a railway bank, and a bit of woodland nearby that is full of them if you know where to look. People don’t like reptiles and amphibia, which sad fact I’ve blogged about before. At one end of the spectrum they’re laughable and at the other end they’re sinister; newts are funny and adders are dangerous. Comments like these also highlight one of my favourite themes; the need to get conservation into the mainstream. Let’s indulge in some more bullet points, however. Because I feel passionately about conservation doesn’t necessarily mean I am an apologist for New Labour/political correctness/multi-culturalism/dumbing down/The European Court of Human Rights/etc. Never under-estimate the ignorance and uninterest of the general public. Guess what % of “adders” are slow worms or grass snakes? Something over 99%? People don’t trust scientists and conservationists and they don’t like “doom-mongering” (i.e. most conservation stories). They trust urban myths, their own experience (often mistakenly, and in any case so what?) and soothing documentary voice-overs. Dr. Chris Gleed-Owen they don’t. That Gussy Fink-Nottle has a lot to answer for. *This is a criminal offence – Ed. Sometimes I need a reason to get up in the morning and drag myself to my desk, and every now and then I get shocked into remembering why I’m doing this. Today’s shocker was the Natural England report Lost Life: England’s Lost and Threatened Species. The report identifies nearly 500 species of native flora and fauna which we have lost since 1800 – the number of total losses is unknown but, of course, likely to be much higher. Around a quarter of our native butterflies and over 20% of amphibia have gone . Some lost species are now globally extinct. In 2008, 943 species were identified as priorities for conservation action in the UK Biodiversity Action Plan (BAP), to be joind by others which have subsequently declined to “precariously low” levels. These two categories now include 26% of all of the native plant and animal species in England. This is bigger than a conservation issue. Looks like I’ll be getting up tomorrow. When you next visit your local garden or pond centre you might see the winsome Charlie Dimmock, who is fronting the new DEFRA Be Plant Wise campaign. Hats off to her and to the campaign, which aims to increase awareness of invasive non-native aquatic plants – it’s apparently very necessary. While I was researching native aquatic and marginal plants to sell on the website, I was amazed that while it was very difficult to find them you could buy all sorts of really aggressive nasties relatively easily. These non-native plants spread incredibly quickly and de-oxygenate ponds and waterways, which is bad news for other flora and for wildlife. For the record, according to the Be Plant Wise website the top five thugs are floating pennywort (Hydrocotyle ranunculoides) parrot’s feather (Myriophyllum aquaticum), pictured left, New Zealand pigmyweed or Australian swamp stonecrop (Crassula helmsii), water primrose (Ludwigia grandiflora) and water fern, (Azolla filiculoides). Thanks to Kate Bradbury for blogging about it on the Gardener’s World site – it’s very much an issue that needs highlighting.